PASSENGERS WERE GETTING ready to board the world’s longest flight today – a marathon 19 hours in the air between Singapore and New York. Two pilots, a special “wellness” menu and more than seven weeks’ worth of film and television entertainment were expected to accompany travellers on the 16,700-kilometre journey to the Big Apple. Singapore Airlines will use the long-range Airbus A350-900ULR, configured to carry 161 passengers – 67 in business class and 94 in premium economy, with no regular economy seats available. For the flight crew – which also includes two first officers and a 13-strong cabin contingent – the workload will be broken up, the airline said, with each pilot having a minimum eight hours’ rest during the flight. The twin-engine plane that will make the journey uses a modified system that burns 25% less fuel than other aircraft of a similar size, Airbus said. Today’s flight will top the current longest direct link between cities – Qatar Airways Flight 921 from Auckland to Doha, which takes 17 hours 40 minutes. “Ultra-long-haul services comprise an important component of that strategy,” an airline spokesman told AFP. 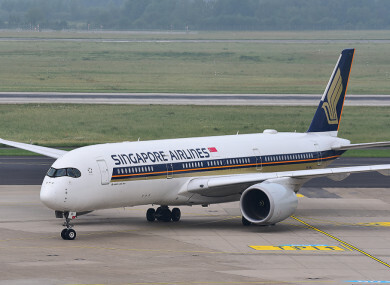 Email “From Singapore to New York - world's longest non-stop flight set for take off”. Feedback on “From Singapore to New York - world's longest non-stop flight set for take off”.